At the end of fall term, 2018, two of the Honors College’s most engaged and beloved faculty partners retired following careers marked by distinction both in honors and across Oregon State University. College of Science faculty members Kevin Ahern and Indira Rajagopal have been central figures within the college for over a decade. In that time, they’ve made significant contributions in the widest variety of roles, encompassing mentorship, administration, recruitment, co-curricular engagement, resource development and – above all – teaching. Both have been recognized as Honors College Eminent Professors. 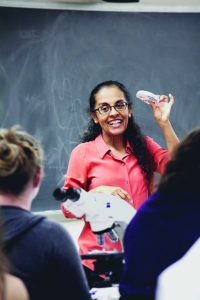 Their involvement with honors began through their teaching (Kevin was a professor of biochemistry and biophysics and Indira a senior instructor in biology and biochemistry and biophysics), and their commitment to the classroom has remained the foundation of their relationship with the Honors College. “I was very acquainted with honors students and activities,” says Kevin. “[Increased engagement] was a natural extension.” Indira was a post-doc teaching biochemistry courses when she heard that there would be one section of the introductory honors biology course open. “I had some quirky ideas about teaching,” she says, “and it seemed like students in honors courses would be the ideal group – it turned out to be perfect. They were ripe for the challenge. The concern that their students thrive as individuals, both while at OSU and after, marks their mentorship and teaching and was a significant factor in their support for the Honors College. 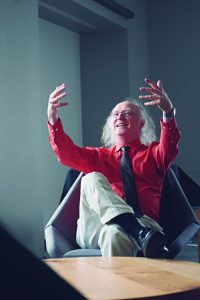 Kevin – who writes poetry and is known for his science-themed songs – has incorporated this approach in his honors courses “The Scientist in the Public Eye,” which teaches interviewing and writing skills, and “Sing a Song of Science,” in which students write limericks and songs about biochemistry. “It’s a way to get people over the fear of biochemistry. Stress is an impediment to learning,” he says. As they picture retirement together – travel and writing and learning piano or Italian – they will most likely continue teaching in some form. “I don’t think I can stay away too long,” Indira says. For starters, they have been working with a company, Great Courses, to develop 36 lectures on biochemistry. And through their many roles in honors – which includes membership on the Board of Regents, the Honors College’s external advisory board, and a stint as co-associate dean – teaching has remained a constant and a foundation.